170 kms from Aurangabad, is the village of Lonar. Over 30,000 years ago, a falling meteorite struck the area creating the world's largest impact crater in basaltic rock. Botanists have recently discovered vegetation life forms not found anywhere else on this planet, in the stunning lake of the crater. There are a few state transport buses that ply between Aurangabad and Lonar, however the best way to go is by private car or taxi. Air Nearest airport is Aurangabad, 122 kms. Rail Nearest railhead is Malkapur on the Mumbai-Bhusawal line. Road Mumbai-Aurangabad-jalan-Lonar, 600 kms. Lonar-Buldhana, 95 kms. 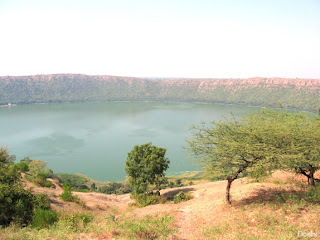 Lonar-Mehakar Taluka, 23kms. Lonar-Aurangabad, 145 kms. MTDC Holiday Resort comprises self-contained rooms and dormitory with a restaurant.